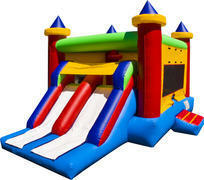 While most competitors brag about combo rides with smaller bounce houses, Air City Bounce delivers with our large 23'Lx15'Wx15'H Double Castle Slide. 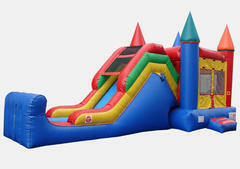 This product is designed to maximize the capacity for fun at any party. 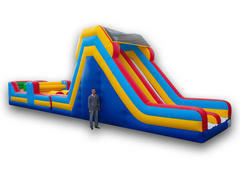 With a larger jumping area and two exit slides, the Double Castle Slide doubles the fun that competitors offer and is a definite crowd pleaser. To add to the fun, Air City Bounce includes a basketball hoop in all Double Castle Slide rides. 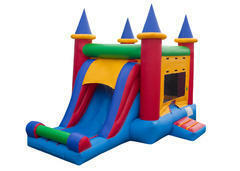 The Dual Castle Combo is a premium product made to satisfy all parties. 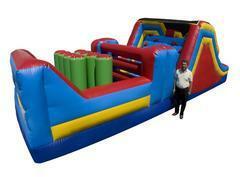 New to the Air City Bounce inventory is The Wasatch an exciting 50 Obstacle Course. 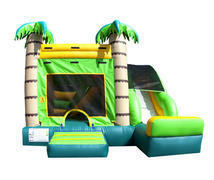 This two-piece ride is fitted with traditional inflatable obstacle course features for every kid and adult to plow through. Participants can jump, push, crawl, climb and slide their way through as they race to the finish. The 50 Obstacle Course boasts an 18-foot tall slide that will have any rider racing with excitement. It even makes for a great form of exercise that is safe for all!